The Denver Nuggets have been playing with a lot hanging over their heads lately, namely Melo’s potential move via trade to one of the NY Metro area teams. Denver-born-and-bred, 14th-year vet PG Chauncey Billups is rumored to be getting shipped out as well in the Anthony deal against his wishes. And it remains to be seen whether former #1 overall pick Kenyon Martin, the team’s second highest paid player, will be able to contribute meaningfully night in and out with his problematic knees. The Nuggets had a big win on Tuesday night over their Western Conference foe, the Phoenix Suns. Fourth-year off-guard Aaron Afflalo scored a career-high 31 points in the 34 point blowout at the Pepsi Center. The victory put an end to the Nuggets’ recent three-game losing streak. Over their last 12 contests, Denver is only playing .500 ball. Clippers last night at Staples. This defeat at the hands of R.O.Y. frontrunner Blake Griffin and company ended Miami’s 13-game road winning streak as well as their 9-game win streak overall. 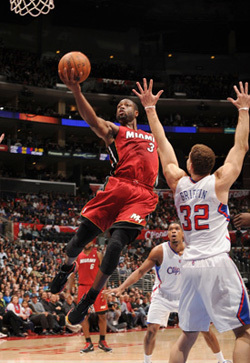 Miami is now 18-3 when scoring more than 100 points in a game. The Heat’s Big 3 may be temporarily downsized to a duo after LeBron James sprained his left ankle in the losing effort in LA. King James is listed as day-to-day and is questionable for tonight’s tip-off. Coach George Karl and crew have had their struggles this first half of the 2011 season, but have defended their home court with ferocity, going 16-4 in the Mile High City (an exact 5,280 feet above sea level). Carmelo Anthony has never lost to the Heat in Denver (6-0), and it’s been 9 years since any version of the Nuggets have allowed Miami to leave Colorado with a W. Denver is second in the NBA in scoring at 106.3 ppg, while Miami is only giving up an average of 92.7 ppg, good for third best in the league. Will LeBron play tonight? 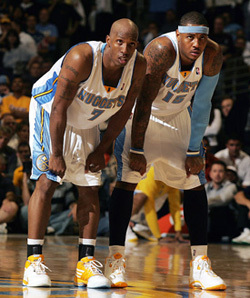 Will this be one of Carmelo’s last games as a member of the Nuggets? Tune in to TNT at 10:30 PM ET to see the Heat make their only visit to the Rocky Mountain State.